Written by Dan Johnson on February 13, 2014 Blog, Sensei. We’ve previously explained how you can use Sensei and WooCommerce Subscriptions to create a membership-based learning site for your courses. The only drawback to this method is that you can’t have a ‘tiered membership’ setup, so if you had a subscription with three options – Bronze, Silver, Gold – gold subscribers don’t automatically get access to the bronze and silver content too. In this post I’ll describe a method you can use to create such a multi-tiered setup, it just requires that you use Sensei in a slightly non-standard way. For this example, we’ll set up a simple 2-tiered membership site with Silver and Gold access. We’ll then create two courses – Silver Course and Gold Course – and make sure that silver members can only access the Silver Course, and gold members can access both the Silver and Gold Courses. This method relies on the free Groups plugin and the Groups for WooCommerce extension to control access to the different membership levels. After installing and activating Groups and Groups for WooCommerce, first we go to Groups > Groups and create two groups – silver and gold – with corresponding capabilities. We then create two WooCommerce products – Silver Membership and Gold Membership – and use the Groups tab to specify what groups customers will be added to when buying the product. 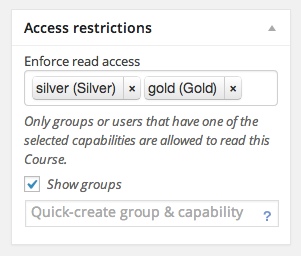 Now we create our two courses – Silver Course and Gold Course, but instead of assigning them to a WooCommerce product to control access, we use the Access Restrictions panel (provided by Groups) to control who can view the courses, based on their capabilities (i.e. what Group(s) they belong to). The Silver Course should be accessible by Silver or Gold members, and the Gold Course should be accessible only by Gold members. The Silver Course is accessible to members of the Silver or Gold groups. The same access restrictions should also be applied to all Lessons within the courses. Now if a non-member tries to visit any of those courses or lessons, they’ll get a 404 error, which is why you have to use Sensei in a slightly different way than you usually would. In Sensei > Settings, you can deselect all of the WooCommerce options, as we aren’t using WooCommerce to control course access. You should leave the Access Permissions option enabled though, as users will still need to be signed in to take quizzes. Normally, customers would purchase a course, and see it in their My Courses page. With this setup however, courses won’t appear in My Courses until you start taking them, so you’ll want to list all available courses on the My Courses page too. You can do that by adding the [newcourses] shortcode to your My Courses page, after the [usercourses] shortcode. This will output a list of all courses available to you (based on your membership level). It will have New Courses as a title, but you can easily change that to Available Courses by adding this code snippet to your functions.php file. 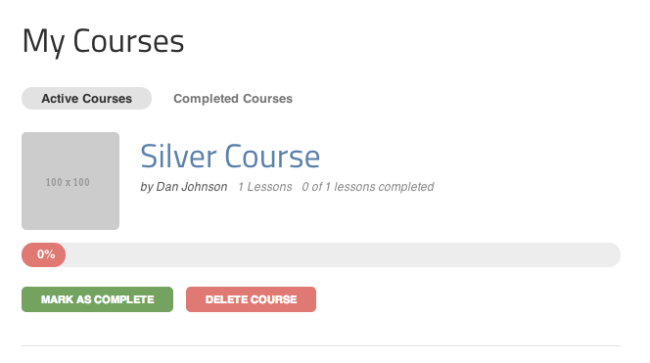 So now silver members will see the Silver Course listed there, and they can click the title, then click Start taking this course and then the course will appear in their active courses on the My Courses page. The Silver Course appears in My Courses after you start taking it. Using this method means you can’t use the regular Courses page to promote and sell your courses, as it will now only display courses that your membership level allows access to. You also can’t view the list of lessons for restricted courses. So instead you’ll need to use your product pages to promote your courses, listing the course lessons in the product description. This case study provides a good example of using product pages to promote your course content. You’ll also want to remove the Courses page from your site’s navigation and instead direct people to the relevant product pages. You could also use this method to create a setup where courses can be sold individually or as an ‘all access’ package. You would simply create a new group for each course, and then an ‘all access’ group, which grants access to each of the individual course groups. If you’ve used Groups with Sensei to create a membership setup, tell us about it in the comments. We always love to hear how you’re using our products in creative ways. Are we likely to get a new theme release this year? As a club subscriber I thought you indicated one theme release a month – did I miss one in January? I think that this post ( http://woocommerce.com/2014/02/themes-cleaning-for-2014/ ) from Feb 4th …kind of …sort of …maybe means ‘No new themes at the moment’. You should have received an email about our club changes too, apologies if you didn’t receive that. Thanks, I didn’t get the email. Its actually the theme you teased in the post you mention I am waiting to see. I know you have a large portfolio to choose from, but having invested quite a lot of time in Listings to see it now being retired, it strikes me I either need to use Canvas or keep an eye on the newer themes which I guess you have used your data to tailor to appeal to a larger market = more sales so worth your time updating. I will just have to be a little more patient! Great post, Dan. This is a way of using these plugins that I hadn’t considered, and opens up some interesting possibilities. Given how long it takes to produce a single quality course, it’s good to have options for deploying that material in different ways. Tiered courses are a great idea… Thanks for the tips! I’m doing a similar product/group/course system on a site I manage. Differences are that I’m not using the Courses or My Courses pages — just Product pages and My Profile. I’m still linking the WooCommerce products to courses so the courses show up in My Profile without needing the [newcourses] shortcode workaround. I’m also using the groups to control access to the BBPress forums that students use to discuss the lesson materials with the instructor. One thing that I didn’t find an elegant solution for is that each course has three levels of participation: full student, auditor and self directed, each with different access to the forums. Because product variations can’t be linked to groups or courses, I’ve had to create a separate course for each level even though the content is identical. Those three courses have three products which are displayed as a grouped product, but each link to a different Groups group and course. In the future I’d love to find a better solution to prevent all the duplicating of content. Sounds like the duplication issue is because you can only assign a course to a single WC product, right? If you used the method described in the post, and didn’t assign courses to products, then you should be able to control access just using Groups, so you wouldn’t need to duplicate your courses. You would then need to use the My Courses method described in the post too though. I see that Groups for WooCommerce has an option to set a duration for the group – would this be the place to set the duration for the Silver product even though I’ve added both Silver and Gold groups to the Silver product, or will I have to utilise WooCommerce Subscriptions to control duration?